‘The Voice’ Contestant Olivia Farabaugh Jams at Coffeehouse Series | The Gettysburgian. On Thursday, February 7, another musical guest graced the Junction stage with a performance organized by the Campus Activities Board as part of the Coffeehouse Series. Her name is Olivia Farabaugh, and she was a contestant on season 10 of The Voice, a trendy and esteemed singing show. Her beautiful voice and bubbly personality made for an entertaining performance, and audience members even had the chance to interact with Farabaugh and her music. Between songs, Farabaugh asked the audience for any requests or opinions on potential songs for the performance. In addition to this new fan’s declaration of love for country music, many audience members clapped and sang along to Farabaugh’s songs, fostering an energy-filled environment. However, the performance was not all clapping and singing. At one point, as the first few notes of “Drops of Jupiter” rang through the Junction, the show was interrupted by an unlikely guest star — EMTs rolling a stretcher. A stunned group stared back in confusion, so the EMT moved on from the premises quickly. 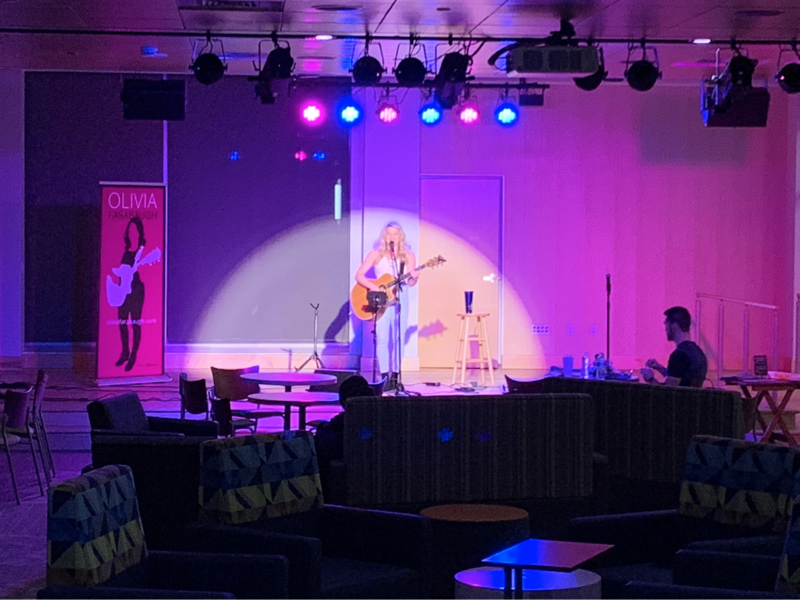 The show continued as planned, and Farabaugh quickly revived the spirit in the room with her music, especially with her rendition of Vanessa Carlton’s “A Thousand Miles,” which inspired Olivia Chatowsky ‘21 and Piper Mettenburg ‘21, sitting near Commons, to chime in and sing the song’s piano riffs. One thing is for sure: Olivia Farabaugh’s performance was one for the ages, and Gettysburg College was lucky to have her.